Mozilla’s Tantek Çelik discusses how new HTML5 elements and microformats offer a simple way to represent web data without additional URLs, file formats, or callbacks. Microformats2 and HTML5 improvements bring better accessibility, simpler markup, improved semantics, and a direct mapping to JSON APIs for data consumers. I’ve written reviews on this blog since I started it in 2001. In fact, the original impetus for starting the blog was so I could review web design books. Google likes microformats. I picked one of my reviews at random and searched for it on Google. 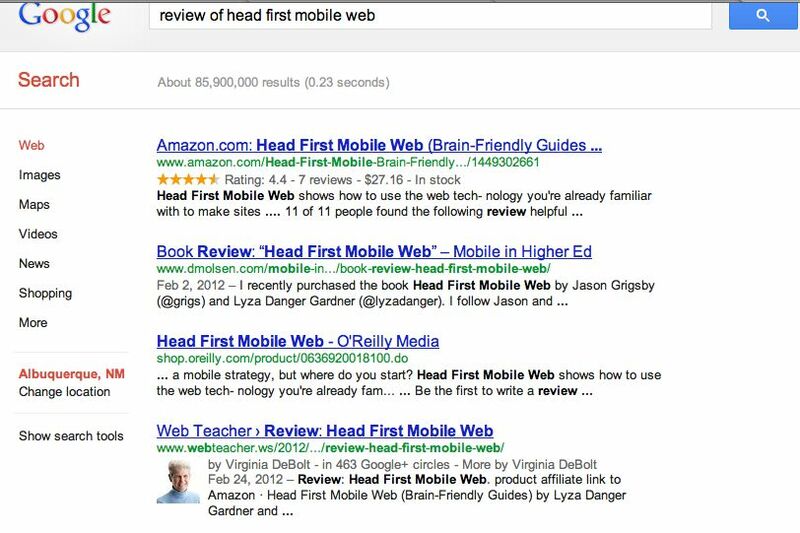 You can see my review is ranked 4th by Google. If you are interested in learning about microformats, I recommend the book I didn’t review called “Microformats Made Simple.” If you like learning from View Source, here are the books I’ve reviewed so you can examine what I’m doing with the code. Pick one, view source, find class="hreview" to see where the microformatted review starts. Soon you’ll know all my SEO hReview secrets. Understanding em units in CSS. ‘Bout time someone explained this. 2 Principles of Object Oriented CSS. Txtmycard.com uses, I assume, microformats to do its tricks. I’m telling you this as an example of how to make money using microformats. Web Data Commons Launches has data showing that about 89% of all structured data on the web is in the form of microformats. 5 Infographics on Web Accessibility for Designers is a nice compilation. 6 Made up Nerd Words that Made it to Common Usage, and 8 that Should. The Separation of structure, presentation and behavior is dead. Must reading for anyone teaching anything in web education. The 7 Golden Rules of Using Technology in Schools. Don’t know how I missed this back in July, but I just found it. Facebook Quietly Adds Microformats to “Download Your Info” Feature. A little slow of the uptake, wasn’t it? For those of you in the business of making apps, a site you may learn a lot from is Moms with Apps. They concentrate on branding, marketing, and practical matters such as getting an app ready to put in the App Store. Chris at CSS Tricks has a great post in Little CSS Stuff Newcomers Get Confused About. Contrast that with Google’s initial commentary about the schema.org structured data markup schema. If Expression Engine is your thing, or if you want to learn it, check out this series of EE Podcasts from Emily Lewis and Lea Alcantara. YouTube’s instructions on how to add captions to your video. How is HTML5 changing web development? An interview with Remy Sharp. Stop Obsessing over HTML5 and CSS3. Paul Boag has some ideas about what we should be thinking about instead of merely worrying about learning HTML5 and CSS3. What I want to know is does Paul – or any web educator – think topics like those he suggests need to be part of a comprehensive web education curriculum? Video Professionals: Just Get a New Life Already! Final Cut Pro X or Really iMovie Pro?